Your workout session might only last 45 minutes or an hour, but your body doesn’t stop working there. After an exercise session, whether cardio or weight training, your body keeps working for the next 24 hours, burning calories, building muscle and recovering. 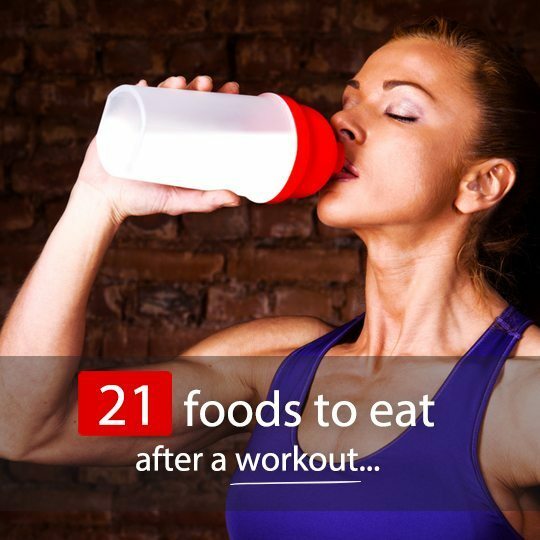 Post-workout nutrition replenishes glycogen, or energy stores; decreases protein breakdown, increasing muscle quality; and increases protein synthesis, repairing any damage caused by the exercise. That means sensibly timed snacks and meals that offer nutritional value and feed muscles can make a huge difference to you training regime. Having said all that, the reality is, if you practice standard regular exercise, and eat a healthy, balanced diet of nutrient-dense foods in the right quantities, planning your meals one to two hours before your workout and one to two hours after it, then you don’t really need to do anything more than that. Of course, if your workout doesn’t quite fit into your breakfast or lunch schedule, for example, then you can plan to have a snack 30 to 60 minutes before you exercise, or straight after exercising. Athletes, body builders and people training for fitness competitions might need to follow very specific diets, eating very specific foods at very specific times, pre and post-workout. Meal plans for these kinds of training regimes can be organized with a nutritionist or dietitian. 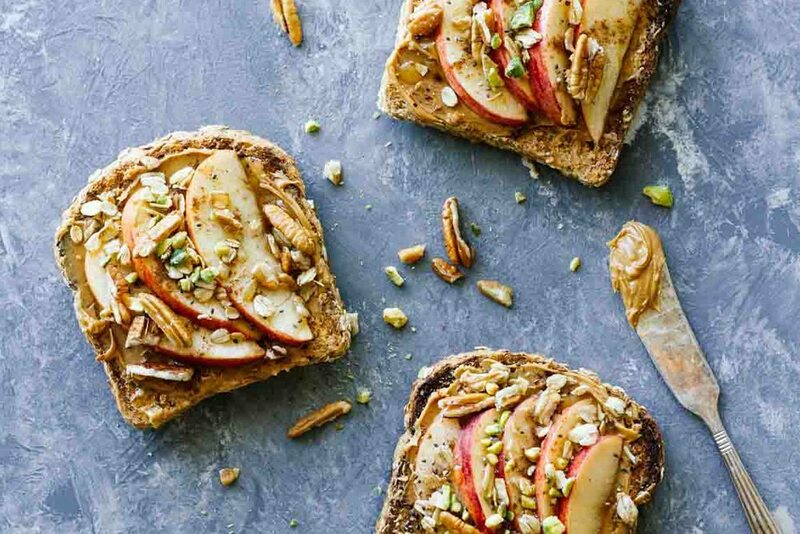 Apple Cinnamon Peanut Butter Toast – If you like to work out before breakfast, then this is a great post-workout meal to fuel your day, but it can also double as a snack. The recipe calls for four slices of toast, but, of course, you should only have one if it’s a snack, and probably two is plenty for a breakfast meal for the average female. Make sure you choose a healthy bread option, such as rye sourdough or sprouted grain. Along with the bread, the recipe calls for peanut butter (go for 100% stuff), an apple, cinnamon, granola, pecans, crushed pistachios and Truvia nectar. Strawberry & Banana Protein Smoothie – Protein smoothies and shakes are one of the handiest, most beneficial post-workout snacks. They are easy-to-make, are packed full of much-needed protein, and you can hide all sorts of other nutrient goodies in there with fruits, vegetables, seeds and nuts! This recipe calls for frozen strawberries, banana, spinach, unsweetened almond milk and vanilla protein powder. Coconut raspberry protein popsicles – For an afternoon workout on a hot day, you can’t beat frozen snacks! Imagine going to your freezer hot and sweaty from a good cardio or resistance session and pulling out one of these tasty treats, that aren’t only delicious and creamy, but are also healthy! The recipe calls for coconut milk, maple syrup, powdered shake (you could also use any protein powder you have at home for this, and add a teaspoon of vanilla extract), raspberries, semi-sweet chocolate chips and coconut oil. Brownie Peanut Butter Cookie Protein Ice-Cream – This frozen raw vegan dessert is healthy, delicious and perfect for picking you up post-workout, either as a snack or as dessert. 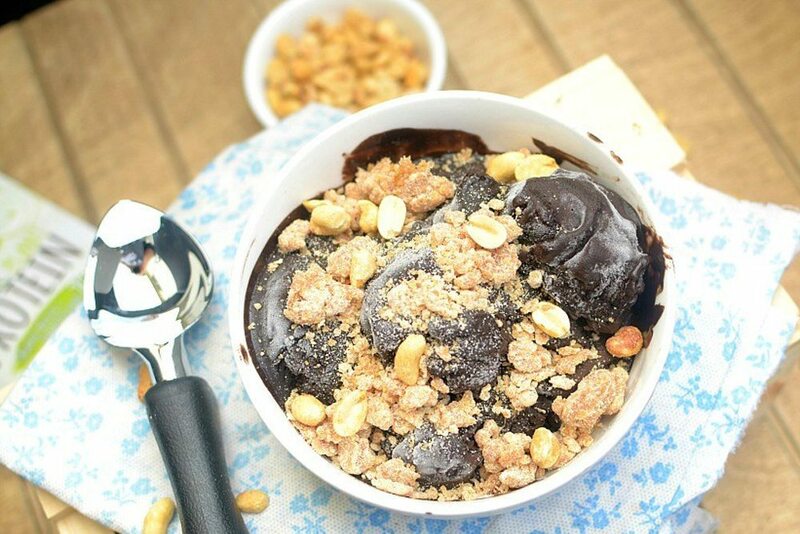 The brownie is made with frozen bananas, almond milk, chocolate protein powder (again, if you have a plain protein powder, you can add cacao powder and maple syrup or stevia), and the peanut butter cookie crumble is made with coconut flour, vanilla protein powder, sweetener, cinnamon, almond or cashew butter, maple syrup and dairy-free milk. Minty Melon Smoothie – This tasty, refreshing shake is super easy to prepare, and includes honeydew melon, vanilla Greek yogurt (or plain Greek yogurt with vanilla essence), honey, lime juice, mint leaves and ice. Simply place all ingredients into a blender, and blend! Chia Berry Popsicles – More popsicles, and with a HUGE hit of fiber and the right amount of fruits for a sugar pick-me-up! The recipe includes strawberries, blueberries, chia seeds, lemon juice and coconut water. 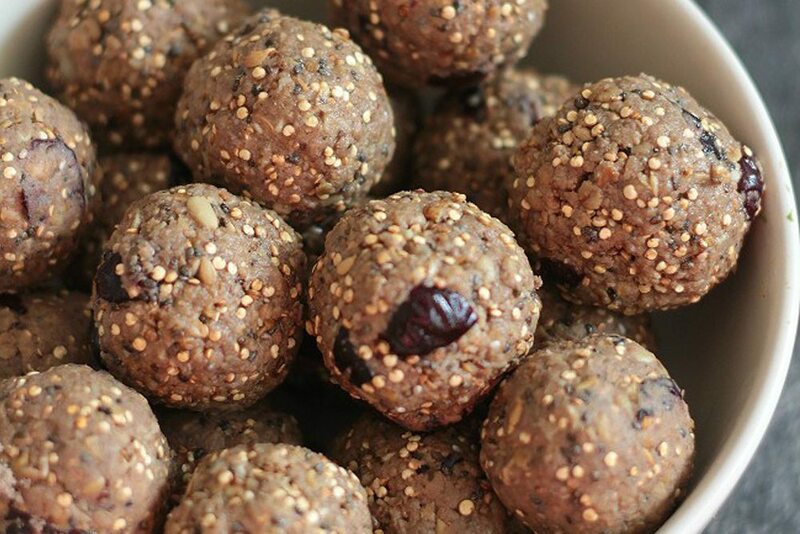 Peanut Butter Quinoa Protein Bites – These nutrient-dense snacks are absolutely brimming with vitamins, minerals, fiber, complex carbohydrates, protein and healthy fats. The recipe is easy to whip up, and includes oats, quinoa, peanut butter, honey, coconut oil, vanilla extract, dried cranberries and chia seeds. Almond Butter Protein Bars – These tasty protein bars are vegan, no-bake and have just eight ingredients, including dates, chia seeds, oats, vanilla protein powder (or plain protein powder with vanilla extract added to the recipe), maple syrup, almond butter, chocolate chips and coconut oil. They are the perfect handy snack to make and eat for the week! 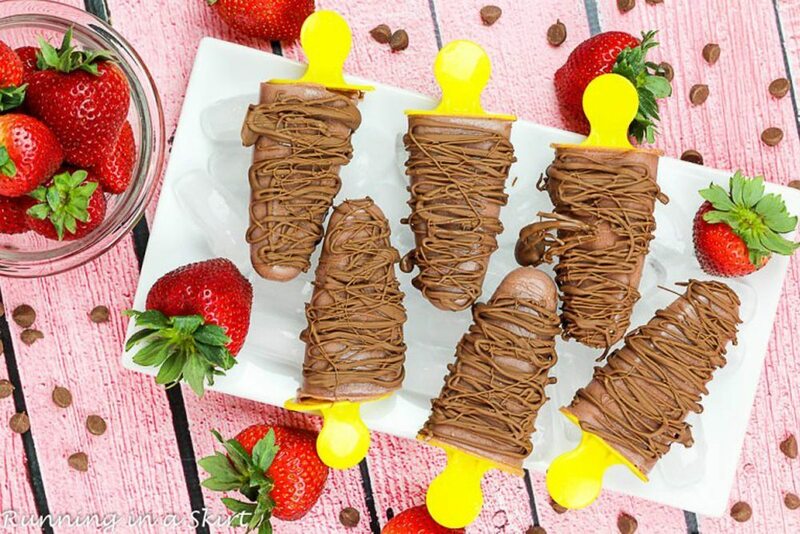 Strawberry Protein Popsicles – Okay… How amazing do these look!? Wouldn’t you love to finish a workout on a hot, sweaty day and open your freezer to this wonderful sight? Easy to make and store, the recipe calls for vegan chocolate protein powder, frozen strawberries, non-dairy milk (such as coconut or almond), and melted vegan chocolate. Easy Roasted Cayenne Chickpeas – Let’s take a look at a couple of savory post-workout snacks – after all, not everyone has a sweet tooth all the time! This has a nice savory flavor with a spicy twist, and needs just four ingredients – cooked chickpeas, coconut oil, cayenne pepper and Himalayan salt. 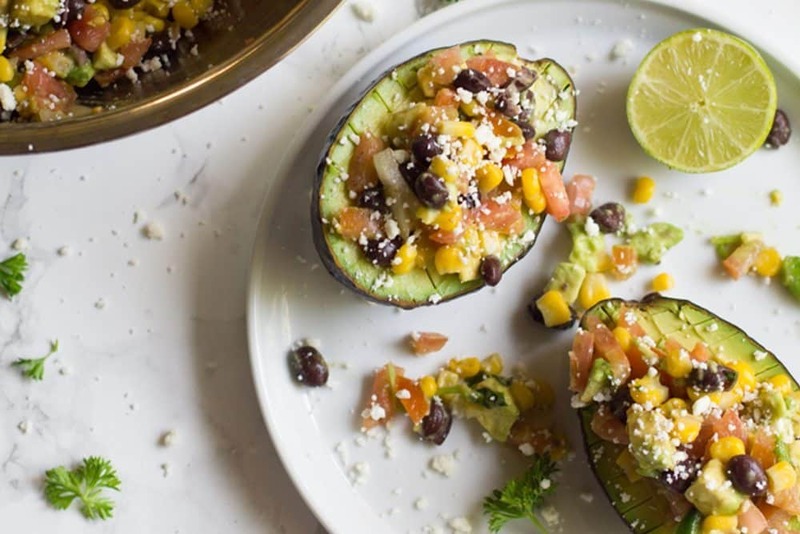 Stuffed Avocado – This delicious, rather filling snack calls for avocados, tomatoes, onion, jalapeno, cilantro, black beans, corn and lime. It is bursting with powerful nutrients, including fiber, protein, healthy fats, vitamins and minerals. Vegan Pasta Alla Bolognese – You can’t beat a warm, filling plate of Bolognese for dinner, and this healthier vegan option is no exception! Get ready for a good go in the kitchen though, because it takes a bit of prep work. The recipe calls for olive oil, onion, garlic, carrot, celery, cherry tomatoes, lentils, sundried tomatoes, basil, walnuts, tomato sauce, chili, nutmeg, balsamic vinegar, salt, pepper, fresh basil and whole wheat spaghetti. 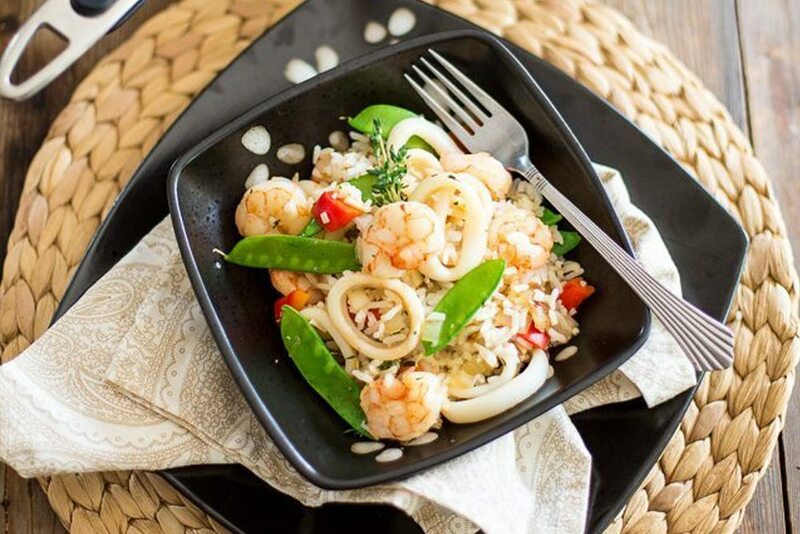 Simple Seafood Rice – Fish and seafood are some of the best sources of lean, high quality protein, and this easy-to-prepare rice dish is a delicious way to consume it. 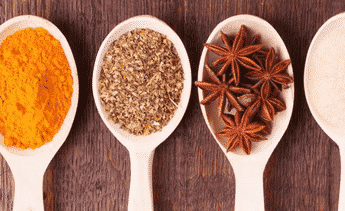 The recipe calls for jasmine rice (but if you want to make it a bit healthier, you can get a brown rice or wild rice blend), calamari rings, shrimp, ghee, onion, red bell pepper, snow peas, garlic, thyme, salt and pepper. Smashed Avocado – It’s hard to beat avocado and egg when it comes to pre or post-workout nutrition. This recipe is a classic and makes a fantastic breakfast or lunch option. All you need is avocado, eggs, lime juice, red pepper flakes, cilantro, salt and pepper to taste, and a slice or two of healthy bread, like rye sourdough or dark rye. Detox Kale Salad – Salads are an excellent post-workout meal option that will make you feel fantastic! This colorful nutrient-rich kale salad includes a delicious homemade dressing option as well as vegetable-based salad recipe. The salad includes kale, red cabbage, broccoli, carrots, red bell pepper, avocados, parsley, walnuts and sesame seeds, and the dressing includes grapeseed oil, lemon juice, ginger, wholegrain mustard, maple syrup and salt. 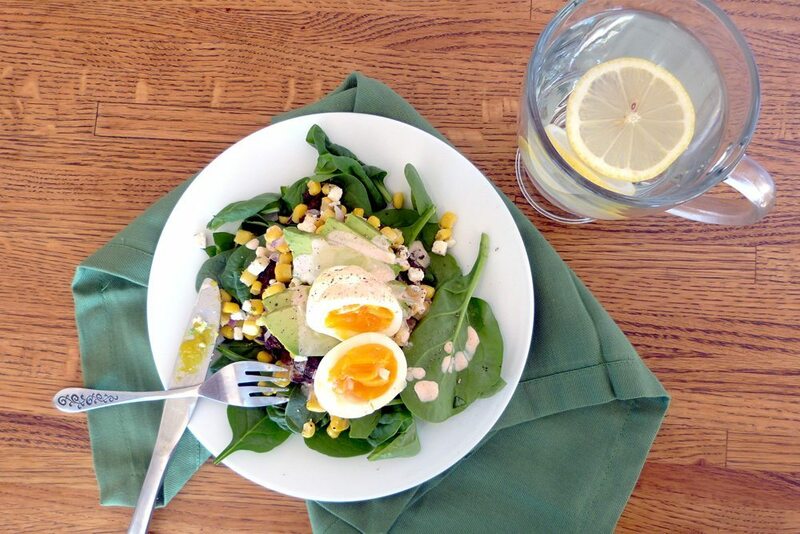 Black Bean Corn Egg Salad – This is packed full of protein, fiber and powerful vitamins and minerals. Made with spinach, black beans, corn salsa (recipe included in link), avocado, egg, mayonnaise, chili pepper sauce and lemon juice. Triple Bean Salad – Beans are one of the healthiest foods on the planet, providing significant amounts of fiber, protein, vitamins and minerals with very few calories. On top of that, they are filling, and keep you full for longer than simple carbohydrates. This recipe calls for bell peppers, black beans, cannellini beans, red kidney beans, spring onions (scallions), jalapeno, balsamic vinegar, lime juice, chili powder and smoked paprika. Lemon Chicken Potatoes In Foil – There might be a lot of ingredients, but once you’ve got the prep work done, this handy meal is simply placed in the oven in one pan to bake! It includes, olive oil, Dijon mustard, wholegrain mustard, dried thyme, dried rosemary, lemon, baby red potatoes, skinless chicken breast, and fresh parsley. Sesame Crusted Salmon – Fish is an excellent source of protein and omega-3 fatty acids, which are very beneficial post-workout. 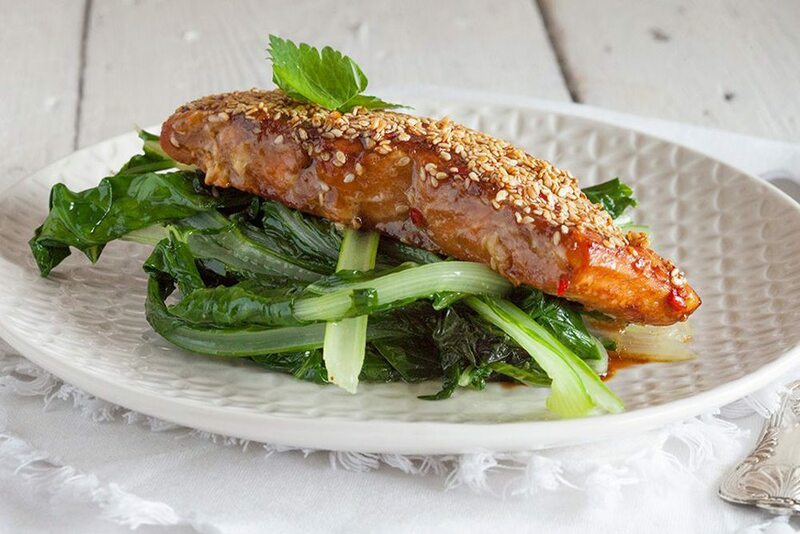 This recipe calls for salmon fillets, soy sauce, red chili pepper, Swiss chard, ginger syrup, sesame oil, sesame seeds, olive oil and salt and pepper. Mexican Kale Salad With Cashew Dressing – Why not treat yourself to a delicious, hearty Mexican meal. And the best part is, it’s healthy! This salad includes quinoa, kale, lettuce, avocado, black beans, cherry tomatoes, carrots and dried veggie chips, and the dressing is made with cherry tomatoes, salt, cilantro, red onion, chili and lime juice. 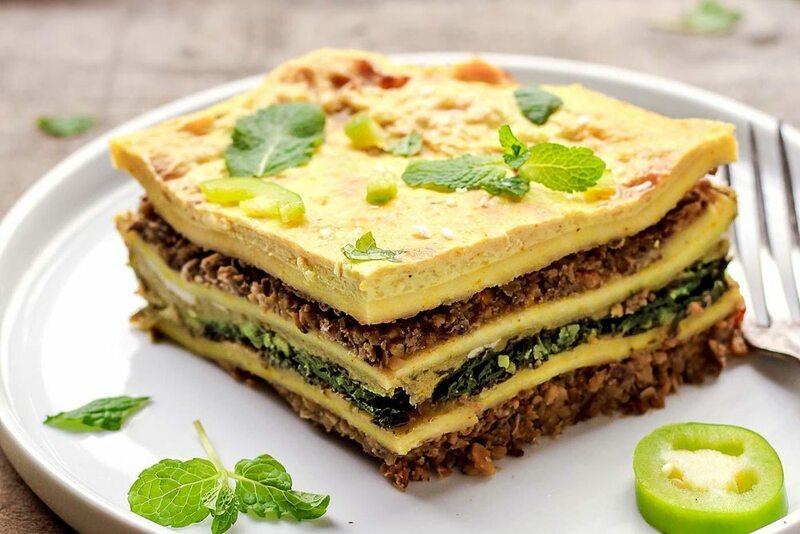 Spinach & Mint Lasagna – This clever plant-based take on traditional lasagna is packed full of nutrients, including protein, healthy fats, fiber, vitamins and minerals. If you love spending a bit of time in the kitchen, this is a fantastic Sunday afternoon cooking adventure! Ingredients include mint green sauce, gluten-free lasagna sheets, mushrooms, soy sauce, olive oil, balsamic vinegar, liquid smoke, chickpeas, oregano, red pepper flakes, spinach, onion, garlic, coconut milk, almond milk, nutritional yeast, potato starch, turmeric, nutmeg, and salt and pepper to taste. Thanks for your recent contact messages and recommendations for sharing content. We’ve added bembu.com to our list of curation sources for future blog posts and promotions for generating traffic from our Facebook page with 27K+ followers. This will undoubtedly generate some free traffic for you! Of course, we’d appreciate sharing any of our posts that you feel are appropriate on your Facebook page!